[quote="panic"]and i was see your map list. Up to 100 can be accommodated. Very nice! Good work! 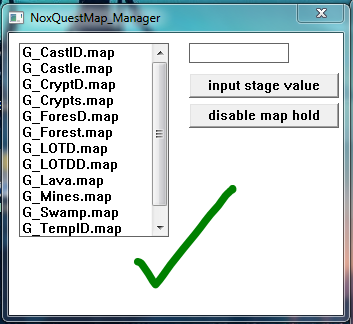 I can finally catalog the Quest maps much easier now, thank you. Oh wow, awesome maps! I will get them added as soon as possible. I know you make great maps and I see a ton of them on your blog but google does a terrible job translating your website. Really wish I could read everything on there, seems like I could learn quite a bit. Do you have a download for all your maps by chance? yeah, my program is buggy. so i will increase limit more higher. and i was see your map list. human vs zombie in house of aooni. Zombies can make humans a zombie. Until time passes, humans must flee to avoid zombies. Without humans, zombies will win. you must escape from 'krusty krap'. but mr.krap was prevent to exit. so you collect coin for destroy obstacle. Bingo! You are the man! That definitely fixed it. Thank you very much!